Alas, my stint as the Romantic Getaways blogger has come to an end: After 90-plus blogs, I am giving up this weekly freelance assignment to take a full-time job. But I want the romance to live on, so I thought I'd list a handful of my Ultimate Romantic Getaways must-dos – each with two suggestions, one a splurge and the other a steal. I hope you'll find the time to get away soon and enjoy some of the places I've loved writing about. Splurge: If you want to feel like you are the only two people in Venice, stay at the Bauer Il Palazzo, and book the private rooftop Jacuzzi (shown above at left) for one hour just before sunset. You’ll get champagne, strawberries, and 60 amazing minutes to soak in the sexiness of La Serenissima – and each other. Rates start at $853/night (private Jacuzzi bookable at an extra charge). Steal: Every suite at Excellence Playa Mujeres, an adults-only all-inclusive located on a white-sand beach just outside Cancun, Mexico, has a private Jacuzzi with both indoor and outdoor access. Plus, the décor is contemporary chic, with polished marble floors and a dramatic four-poster bed. 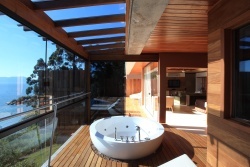 The beach and the meandering freeform pool may beckon, but the top spot to relax à deux is just steps from your bed. Rates start at $375/night, all-inclusive. Splurge: It’s hard to beat the panorama at Jade Mountain, where the resort’s organically designed wood-and-stone “sanctuaries” let you enjoy nonstop views of St. Lucia’s twin Piton peaks (shown at right) from the romantically netted bed, the massive private plunge pool, and even the bathtub for two. There’s no fourth wall, so you’ll feel peacefully at one (make that two) with nature. Rates start at $950/night. Steal: For stellar views of a wild and untamed coastline – at prices that won’t break the bank – check into The Atlantis Hotel on Barbados. Opened in late 2009 on the island’s Atlantic coast near Bathsheba, the hotel features contemporary Caribbean décor and a wonderful restaurant serving Bajan-inspired cuisine. Rates start at $255/night. Splurge: Marrakech, Morocco, is the ultimate dream desert for many couples in search of an exotic getaway, and the perfect place to turn dreams into reality is the newly renovated La Mamounia, located right in the heart of the ancient medina. The hotel’s interior design is a visual kaleidoscope of rich colors and amazing artisanship (ceramic tiles, carved wood and stone, splashing fountains), its pool and spa are reinvigorating oases, and its Le Marocain restaurant is a taste-treat you won't forget. Rates start at $628/night. Steal: You don’t have to fly across the Atlantic to rock a Morocco-meets-Andalusia vibe. Simply head to Scottsdale, AZ, and check into The Montelucia Resort & Spa, where the region’s colorful décor and exotic spa ambience (the decadent Joya Spa is a luxurious haven) have been transported beneath the gaze of iconic red Camelback Mountain. Rates start at $231/night. Splurge: One of the most romantic wine regions in the world is the South African hamlet of Franschhoek, where its Food & Wine Route serves up bites and sips you’ll long remember. Located a short and scenic drive away from stunning Cape Town, Franschhoek, which means “French corner,” is home to 42 wineries (making varietals from cabernet sauvignon and shiraz to pinotage and sauvignon blanc) and world-famous restaurants such as The Tasting Room in Le Quartier Francais, a serene and sophisticated boutique hotel. Rates start at $537/night. 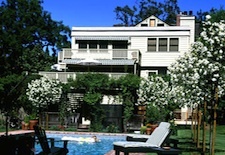 Steal: Vintage romance is a bit closer and more affordable in California’s Sonoma Valley, where the charming Gaige House (shown above at left) gives you an intimate, Asian-inspired boutique hotel setting, complete with a pool and spa, close to an array of award-winning wineries and the adorable town of Glen Ellen. Rates start at $186/night. 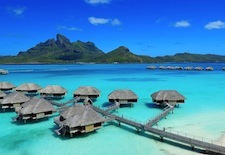 Splurge: If you are going to splurge on a trip to exotic French Polynesia (aka Tahiti), you should definitely go all the way and stay at the Four Seasons Resort Bora Bora, the South Pacific paradise’s newest luxury resort, which opened in late 2008. All 100 thatched-roof overwater bungalows (shown at right) are spacious and indulgent, but for the ultimate in romance, book one with a private plunge pool and postcard-perfect views of Bora Bora’s Mount Otemanu. Rates start at $1,015/night. Steal: If your budget is more modest, make lush and mountainous Moorea your destination and you can still sleep overwater in style. Moorea is an easy 30-minute ferry ride from Tahiti’s international airport, but it feels worlds away. My picks are the overwater bungalows at the intimate and welcoming Moorea Pearl Resort & Spa. Rates start at $474/night. Splurge: If today’s 4,000-plus-passenger mega-ships are like Vegas, then the Yachts of Seabourn are like floating villas, where you sign for nothing and the staff knows your name. 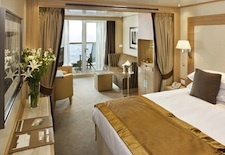 Even Seabourn’s newer, larger ships – Odyssey, Sojourn, and Quest – carry just 450 passengers and make an intimate and ideal base (that's a Veranda Suite onboard Seabourn Sojourn shown at left) for exploring romantic ports of call in the Mediterranean, Adriatic, Baltic, Aegean, and even around the world. Onboard, there’s fine dining in three restaurants and a spa with an aft Jacuzzi that’s the perfect spot for sundown sail-aways. Seven-night cruises from $3,120/person, all-inclusive. Steal: The three newest ships from Celebrity Cruises – Solstice, Equinox, and Eclipse – are large (2,850 passengers) but they’ve been built with an emphasis on style-savvy design and grown-up fun. Three favorite spots: the al fresco Lawn Club featuring real grass underfoot as you enjoy cocktails or casual outdoor activities; the panoramic Sky Observation Lounge with its floor-to-ceiling windows; and Cellar Masters, a sophisticated wine-tasting venue. Seven-night cruises from $959/person. Splurge: If you look at a map of Brazil, the largest country in South America, and work your way southward down the AtlanticCoast past Rio de Janeiro, you’ll come to Santa Catarina state. And along this emerald-hued coast, you’ll find Ponta Dos Ganchos, an idyllic luxury resort set on its own peninsula. This 25-bungalow enclave – the best are the spacious and contemporary Emerald Villas, shown at right – is the perfect spot to unwind, enjoy a seaside massage, and dine on expertly prepared local cuisine. Emerald Villa rates start at $1,475/night, including meals. Steal: No passports are required to chill out for a while on the laid-back Hawaiian island of Lana’i, which doesn’t have a single stop light but does have the luxurious but affordably priced Four Seasons Resort Lana’i, The Lodge at Koele. Set amid towering Cook Island pines, this upcountry manor house (with beach privileges at sister property Manele Bay Resort) is a quiet spot to golf, play croquet, or chill in a hammock with a good book. Rates start at $295/night. See our Venice, Cancun, St. Lucia, Barbados, French Polynesia, Marrakech, Phoenix, South Africa, Sonoma, Brazil and Hawaii Travel Guides for more trip-planning information, then use our Travel Search price comparison tool to find the lowest rates on flights, hotels, packages, and more travel deals.